Facebook has given their Pages an overhaul so that you can "make it easier for you and your fans to connect with each other". And it comes with its good and bad points. Here's an overview of what has changed and what has not... Well, I don't think anything has remained the same. The look has been revamped to look like the new profiles. You'll find everything you would in tabs, to the left, as you can see in RNIT's Page up there, or over here. They took away our application tabs from the Profiles. Good they didn't do that with Pages. That would truly aggravate admins. So many companies wouldn't be able to hold contests, advertise products and have a landing page. This time, Facebook has provided Page admins to preview how their Page will look like when it's upgraded, so that they can modify and plan it before upgrading. Again, there is an emphasis on photos with the Photo Strip on top. I don't see how that's useful. 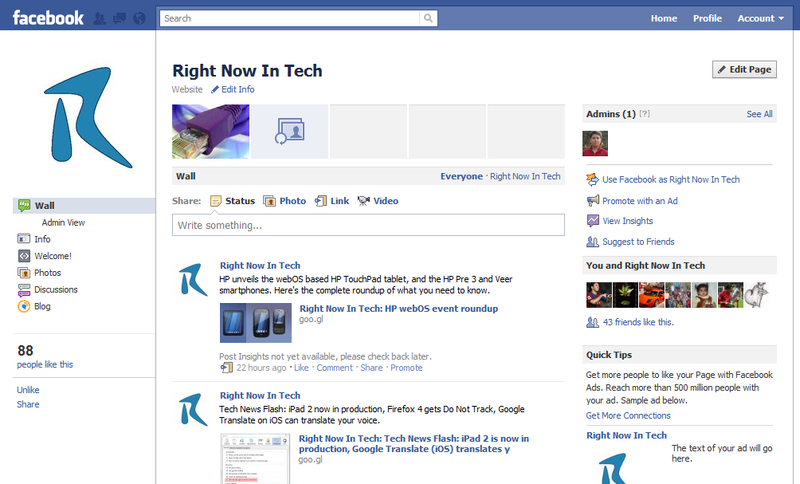 And Right Now In Tech's Facebook Page has almost no photos. I guess I'll have to add some to make it look fuller. All the Pages will automatically upgraded to the new layout sometime in March this year. One of the most notable and interesting features now is the ability of admins to 'use' Facebook as a Page. I haven't used this for a really long time, but it makes you behave as if you were the Page. That doesn't sadly mean that you can start commenting and writing on peoples' Wall and trolling as you advertise your company. As an admin, you will simply receive notifications of happenings on your Page. You will also get a list of recent 'Likes' for the Page instead of friend requests. You will also be able to see your Page stats at a glance on the right. 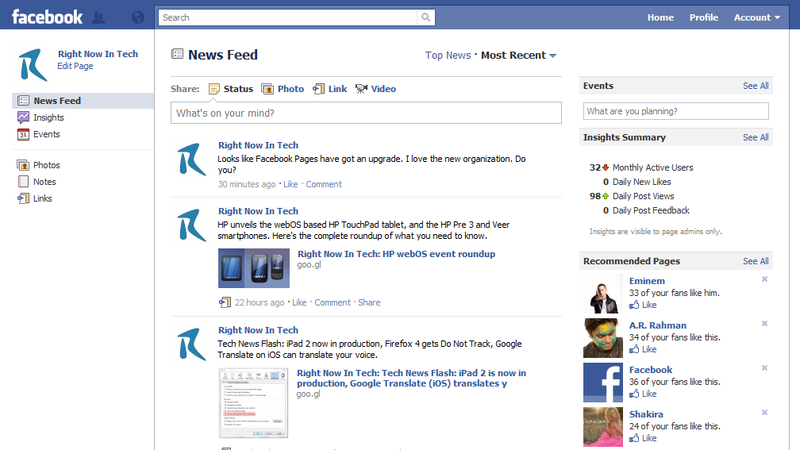 Here's my News Feed when I use Facebook as RNIT. If you have a Page yourself, you can just browse to it and you will get the options to preview, take a tour and upgrade right at the top. What do you think about it? Write it in the comments. And remember to Like RNIT on Facebook. Prefer Twitter? Email? RSS? Check out this page!